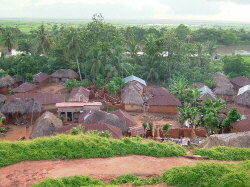 The economy of Benin remains underdeveloped and dependent on subsistence agriculture, cotton production, and regional trade. Growth in real output has averaged around 5% in the past seven years, but rapid population growth has offset much of this increase. Inflation has subsided over the past several years. In order to raise growth still further, Benin plans to attract more foreign investment, place more emphasis on tourism, facilitate the development of new food processing systems and agricultural products, and encourage new information and communication technology. Specific projects to improve the business climate by reforms to the land tenure system, the commercial justice system, and the financial sector were included in Benin's $307 million Millennium Challenge Account grant signed in February 2006. The 2001 privatization policy continues in telecommunications, water, electricity, and agriculture though the government annulled the privatization of Benin's state cotton company in November 2007 after the discovery of irregularities in the bidding process. The Paris Club and bilateral creditors have eased the external debt situation, with Benin benefiting from a G8 debt reduction announced in July 2005, while pressing for more rapid structural reforms. An insufficient electrical supply continues to adversely affect Benin's economic growth though the government recently has taken steps to increase domestic power production.